Exeter City full-back Craig Woodman has to do better, according to manager Paul Tisdale, after costly mistakes in their last two home games. Woodman scored an own goal in the after his error led to a goal for Tranmere last month. "He's been one of our best players this year, but that's two games in succession that he's made a meal of a cross to the back post," Tisdale said. "He's wise enough and good enough to be better than that and I've told him so." The result left Exeter ninth in League Two, but the gap to the play-off places increased to three points. 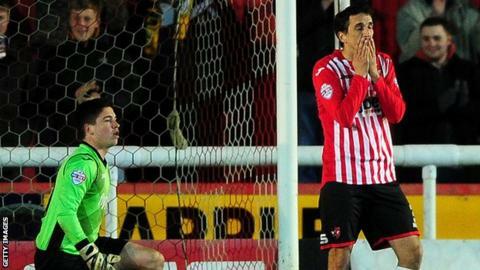 "I've got mixed feelings," Tisdale said of the result, which saw Exeter come back from 2-0 down. "I congratulated them because they were outstanding in the second half and spoke about issues in the first half and how we got things wrong in the first half. "But I know a point is a valuable point, especially when you're 2-0 down."